Roger Allan Polillo, 55, longtime Livingston, Montana resident passed suddenly as the result of a heart attack at his home on Monday, September 3rd, 2018. A memorial service will be held 6:00 P.M. on Friday, Sept. 7th, hosted at the Holbrook United Methodist Church, 424 W Lewis St, Livingston. Veteran’s honors will follow the service at the church. A reception will follow the honors at the church, light refreshments will be provided. Roger was born April 20, 1963 in Livingston, MT to parents, Philip and Sharon (VanGilder) Polillo. He attended schools in Livingston graduating from Park High the class of 1981. Following high school, he worked various jobs moving around a bit. In 1988 he began a career with the Air Force, he was inducted on April 19, 1988. He was stationed at Heyford base in England, Cannon in New Mexico, Osan in Korea, and Nellis in Las Vegas. While enlisted he served overseas in Operation Desert Storm and Korea. 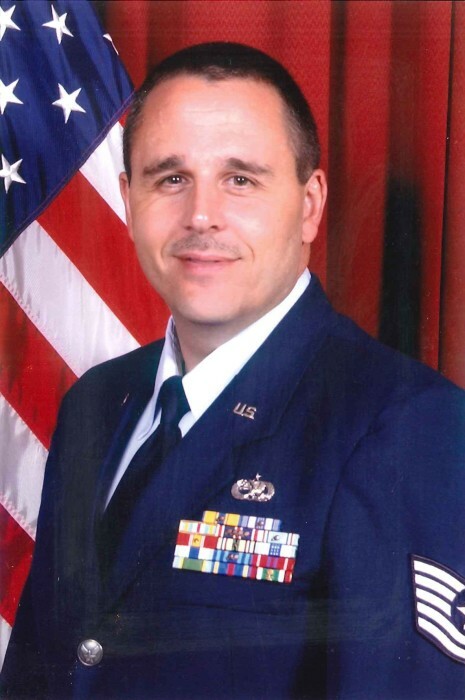 He was employed as a Tactical Aircraft Maintenance Craftsman and Journeyman. His specialty was in the Predator Drone System. He served as a training supervisor and a technical training teacher. Roger had been awarded: Air Force Commendation Medal with one Oakleaf Cluster, Air Force Achievement Medal with one Oakleaf Cluster, Air Force Outstanding Unit Award four Oakleaf Clusters, National Defense Service Medal one Service Star, Global War on Terrorism Service Medal, Korean Defense Service Medal, Small Arms Expert Marksmanship Ribbon (rifle). Roger was honorably discharged on September 30, 2008 with high merit and encouragement to reenlist. On January 7, 1995 Roger was united in marriage to, Shelly Ann Fagan, in Clovis, New Mexico. They began their family welcoming daughter, Kayla in 1995, in 1996 they were faced with the hardship from the loss of a son, Allan, but again blessed in 1998 with the birth of their son, Matthew. During Roger’s enlistment the family was stationed at the locations listed above. In 2008, when Roger retired, they relocated to Livingston to be near Roger’s family. We are immensely proud of Roger’s service to his country and above all else his devotion to his family. He was a wonderful husband, and ever-present and loving father. Roger was active in park county 4-H for 7 plus years, he was a coach for shooting sports, coached both of his children, he took them to national competitions. Both his kids have followed in his footsteps becoming shooting sports coaches themselves. Many Livingston children will remember Roger as their friendly bus driver. Roger always tried to get the activities driving assignments that his kids were involved in, so he could be there to watch and support them. He also drove for every other activity he could as he loved to cheer on the all the kids, and the kids always enjoyed Rogers presence. Roger's hobbies had to do with anything nerdy. He loved flying drones, creating with his 3-D printer, and was on every wait list for the latest technology. He also liked snowmobiling, hunting, shooting with the kids, tinkering with just about everything, and has taken pride in his home improvement projects. He is survived by his wife of 23 years Shelly; daughter, Kayla Polillo and her significant other, Clint Murie; son, Matthew Polillo; sister, Shelly (Todd) Bailey and nephew, Jason (Amber) Bailey and their children, Stetson, Westen, Siara; niece, Dusty Dawn Bailey and her children, Chandler, Clayton, Damyon. Preceded in death by his parents, baby boy Allan, and nephew, James Bailey.